Let’s face it, with drunken relatives, overcooked turkey that tastes more like drywall than actual meat, and socially awkward situations amongst family members you only see once or twice a year, and truthfully you don’t even like anyways, Thanksgiving for many of us is vastly overrated. Which is why Friendsgiving can provide a much-needed antidote to overstuffed tradition. Friendsgiving games will give your guests that antidote. And you cannot have a proper Friendsgiving without games. Lots and lots of games. If however, you remove the annoying family members and overcooked food, and instead add some of your best pals, along with copious amounts of booze and unhealthy, yet delicious, food, you have the recipe for the perfect celebration. Well, you can now have all of the above, if you decide to throw your very own Friendsgiving celebration. No matter what your reasons for throwing a Friendsgiving party may be, here’s a look at fun Friendsgiving games and activities to allow you to throw the best Friendsgiving party in town. Creating your own headwear is one of the more popular Friendsgiving games and activities because it allows everybody to get involved. Find a Michaels or a local craft store and find as much fun stuff to stick to construction paper that you can. You can even give them an extra incentive to really get creative by perhaps holding a competition in which the person who creates the best headwear will win a prize? If you have kids at the Friendsgiving celebration, you will really score points with this Friendsgiving activity. Whilst excessive alcohol consumption is never a good idea, let’s face it, if you are going to drink excessively, you may as well have fun in the process. Just DVR the Parade so you can watch during your day-after Friendsgiving celebration. You can basically make the rules yourself, so for example: Every time you see a Muppet, or a guy wearing a cowboy hat, somebody has to down a shot (or take a sip, for those less adventurous types. For a more sensible game, however, rather than downing shots of booze, why not make it exercise-themed instead I.E instead of taking a shot, you have to perform 10 jumping jacks or push-ups etc. This will also help you build up an appetite so you can eat your own bodyweight in Turkey and Pumpkin pie when the feast begins. It’s always fun to turn being grateful into a competition. Being thankful isn’t cheesy or lame, it’s an integral part of everyday life. Although as far as Friendsgiving games are concerned, this one may not be the most thrilling, you should still take the time for you, and your guests, to let others know what you’re thankful for before you begin filling your faces. Add a twist: See who can come up with the most heartfelt, funniest and weirdest thing to be thankful for on Friendsgiving. It will get your guests opening up. Pro tip: Push this angle after the wine starts flowing. 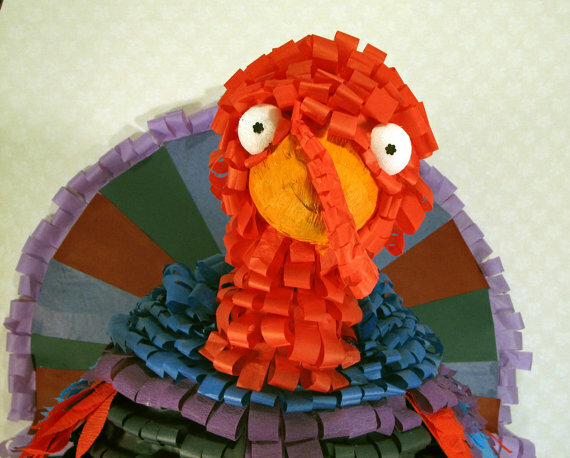 Turkey pinatas are just as fun the day after Thanksgiving. No party would be complete without a piñata so if you’re still looking for a few more ideas and suggestions for some awesome Friendsgiving activities, pick up a piñata, fill it full of goodies, including perhaps, a few plastic airplane alcohol bottles, pull out the blindfold and bat, and encourage your guests to knock the heck out of it. Just make sure you don’t hang it near to any valuables which could accidentally get whacked in the process. You need board games. And you can’t go wrong with modern party favorites like Cards Against Humanity and Taboo. But what might be even more fun is bringing back fun childhood favorites like Hungry, Hungry Hippos and Operation. Or go with some old classics, sans plastic parts, like charades or Truth or Dare. 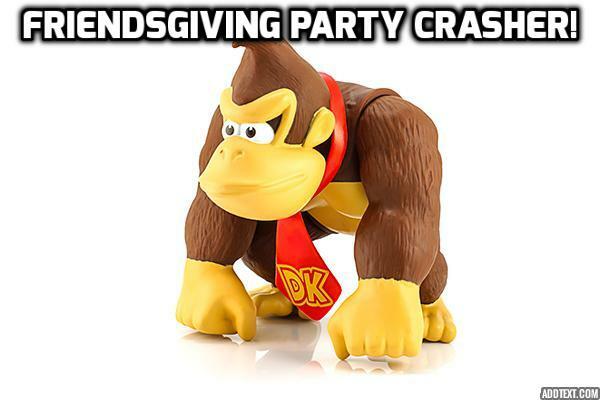 Invite your buddy Doonky Kong to crash your Friendsgiving game party! Do you still have a Wii? 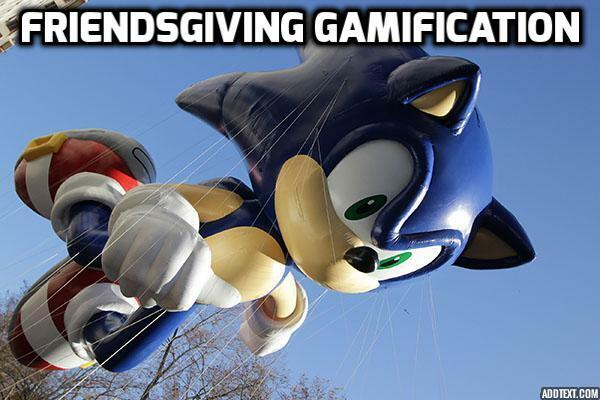 That could be the perfect video game for Friendsgiving activites. Maximum guest participation, combined with very little need for actual video game skills. Or use whatever video game console you have on hand. You could have a Sonic the Hedgehog marathon, if you can get your Sega Genesis working. Or an Tecmo Super Bowl tournament on the original Nintendo. Just don’t let anyone use the Raiders and Bo Jackson. That’s just unfair. While touch football may come out of the American/Kennedy tradition for Thanksgiving, Friendsgiving can claim its own global, multicultural sport as its avatar. Throw on a hoodie, grab a basketball and get a pickup game going. Or even just a spirited game of H-O-R-S-E. But if you must insist, a great game of touch football is a great way to work off the stuffed feeling from Friendsgiving dinner, before you dig into dessert. Friendsgiving won’t be complete without a craft beer flight. Have all your guests bring their favorite wine (or beer or spirit) and have a tasting! Set up a portion of your party room with extra glasses or cups, creative scorecards for tasting notes and all the booze. 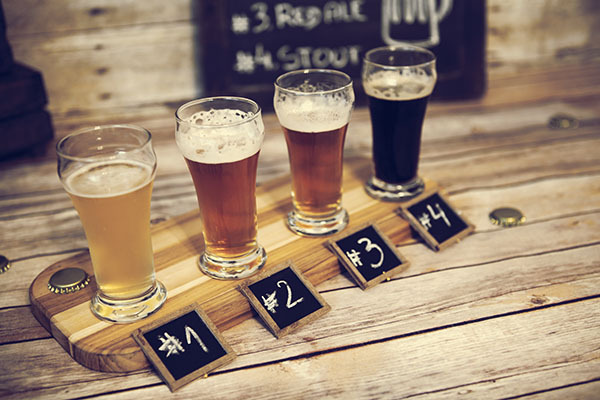 The party goers can rate each drink, argue about their favorites and pick the best one. The winner gets a $5 gift card to Dunkin or Starbucks. Or bragging rights until next year’s Friendsgiving. We already know that we would rather break bread with friends that we see every day, rather than awkward uncles and problematic aunts that we only have to see because the calendar says so. That’s why a Friendsgiving makes so much sense. But what do you do before, and after, the turkey, the stuffing, and all that pumpkin pie has been passed around. You want to get into the spirit of the season, and that means doing more than just sitting around, sharing stories, and sipping on drinks – you need something even more special: games! Hosting your own Friendsgiving games isn’t just a good way to pass the time, though, it’s really an opportunity to create a whole new set of traditions to pass on year after year – I mean, what’s Friendsgiving without a little bit of tradition. This is a celebration of some of the people who mean the most to us, so it’s okay if we get a little sentimental. Worried that karaoke is only fun after a few bottles of vino? Don’t worry, when you’re with friends it can be fun all of the time. The best part is that you can ditch the expensive, and overrated, karaoke machines that you’ve seen on infomercials at 3AM – and go with everyone’s favorite social network: YouTube! 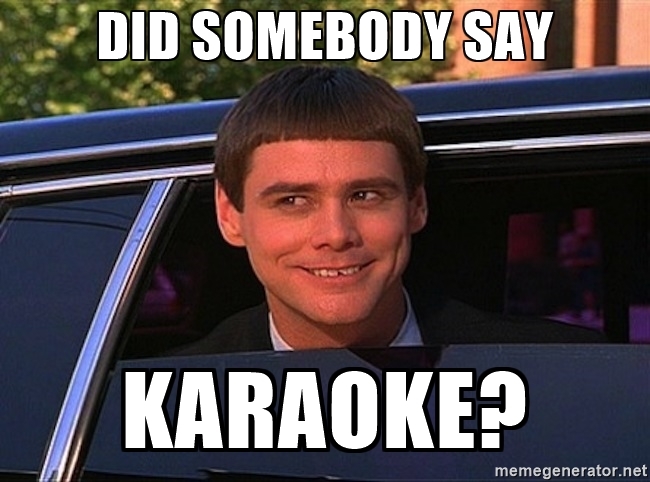 You’d be amazed at how many karaoke versions of songs are available online, simply search them up and do your best Adele impression. For a unique spin, and because they’re your friends, choose songs for one another and have your very own American Idol competition (because it’s even more fun when you don’t know the words). This one is going to require a little bit of planning in advance, but it’s the perfect game for friends both old and new. 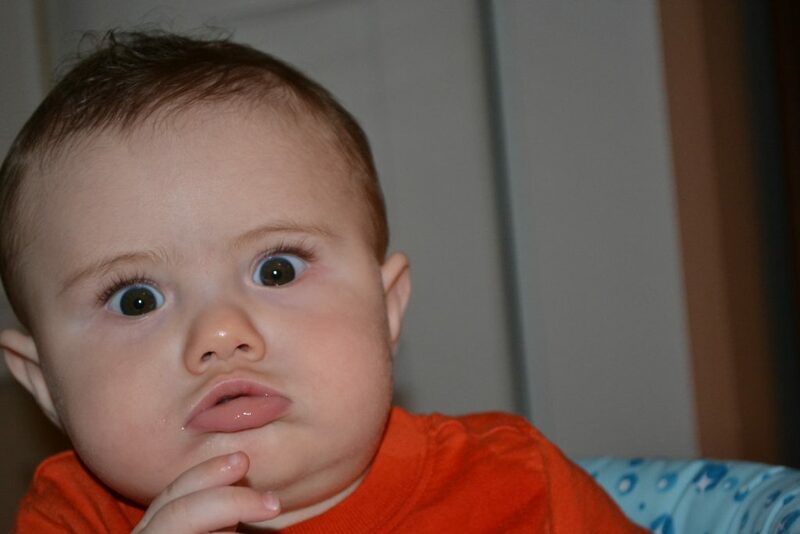 Ask everyone attending to bring a picture of themselves when they were young, it can be as a baby, as a toddler, or anywhere up until the age of about 9. Once you’ve collected everyone’s pictures, put them up on a board. Give everyone a piece of paper, after numbering each of the pictures, and have them guess who’s who. Not only is this a fun game involving trivia, but it really gives everyone a good opportunity to get to know one another on an even deeper level. After the game is finished, have everyone reveal who they were – and maybe even have them share a fact, a story, or something quirky from their childhood. This is a game that only requires a pad of paper, a pen, and a group of friends – perfect for a Friendsgiving, and even better after a couple glasses of the good stuff. This game is all about storytelling, as everyone goes around (after being positioned in a circle), and writes down one line of a story on a pad of paper. 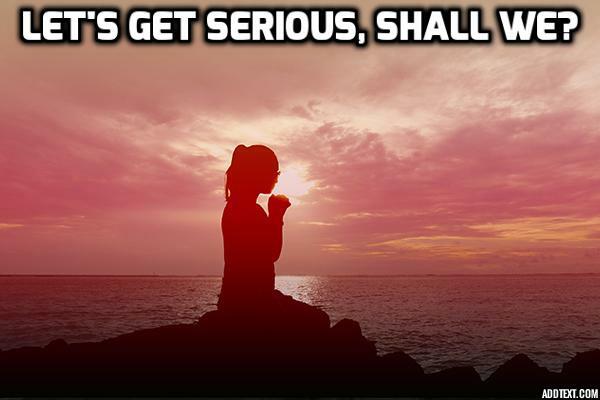 One by one, chances are your story will get funnier and funnier. Worried you don’t know where to start? There’s an easy solution for that. If you want a surefire starter sentence, start with a proclamation – “And then the man screamed.” What did he scream? That’s for the person beside you to figure out! After you’ve finished writing a couple pages, nominate the best public speaker to read the story out loud. Come up with a final title for your story, sign it as a group, and even save it to read next door – this can be something of a Friendsgiving heirloom. This is an awesome blast from the past. 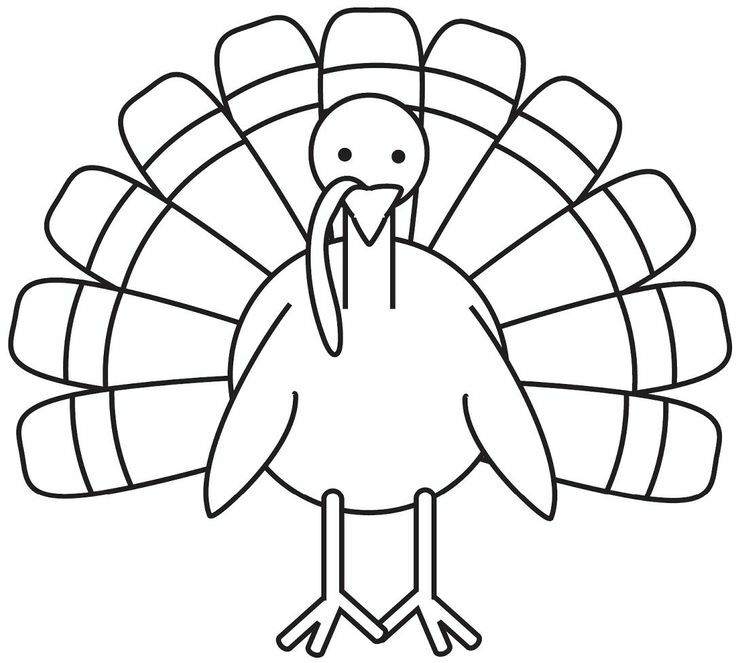 Back in elementary school, chances are you had a class project of drawing turkeys using your hands. You’d place your hand on a piece of paper, trace around it (as best as possible), and then fill it in with all sorts of colors. This is exactly that game, except now you’re adults! Get your tracing game back in order, color your turkey to the best of your ability, and then judge the group’s turkeys and find out who has the best skills to match a Monet or a Van Gogh. Pro tip: if you’re worried about your friends getting into the spirit of things, attach a gift card to your favorite cafe, bar, or department store, and chances are you’ll notice them taking things a lot more seriously when the crayons come out. Have Some Fun This Friendsgiving! Friendsgiving is all about sharing smiles, laughs, and good times with the people you care about the most. We all know that Thanksgiving with your family is super overrated, and with these games it’s only going to stay that way. Create new traditions, or competitions, and have some fun along the way with these awesome Friendsgiving games. 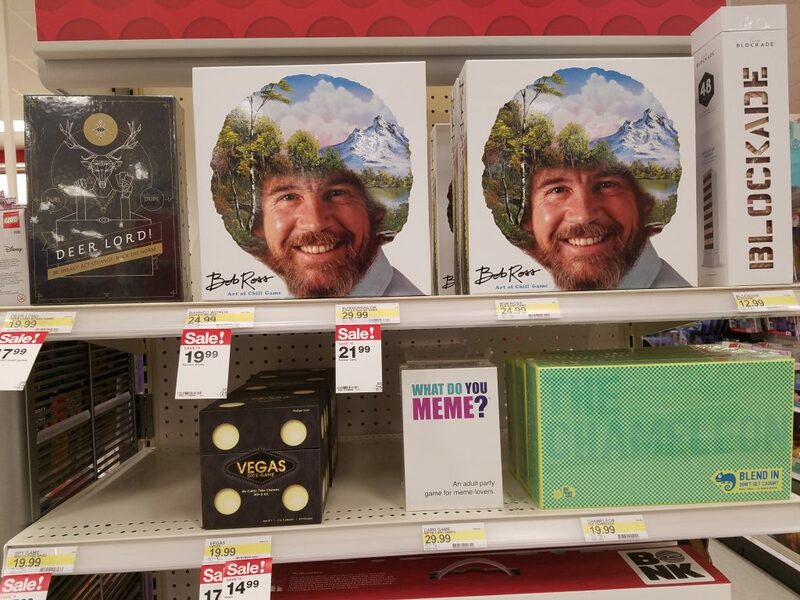 I mean, there is even the Bob Ross game where you can make your own little happy accidents. Which will you play? Whichever one of these Friendsgiving games you pick, just remember to have fun and be safe. Now, let the celebration begin.